Deciding to sell games is a tough decision for any game, but especially for me. But my shelves are full and it's time to let some go. At 668 titles (not counting expansions) I can't even play them all in a year...or two years...or even probably five. It even looks like Puerto Rico, but the box is significantly smaller. San Juan is, essentially, Puerto Rico: the Card Game. Since I already have Puerto Rico, and we very rarely play this, I was thinking of putting it on the auction block. My suspicion that it never gets played were confirmed when we opened the game to give it one last hurrah. It was in pristine condition. The scorepad had been marked up with only one game. I always wonder why the box is so big...oh, and my copy's not in German. 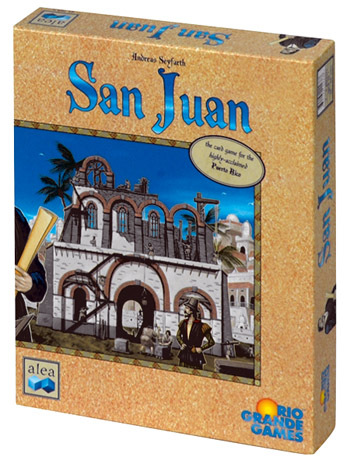 San Juan is essentially a card game in which cards have several functions. Every card has a building on it, which can be bought and placed on the table as a building, giving both victory points and a special power. 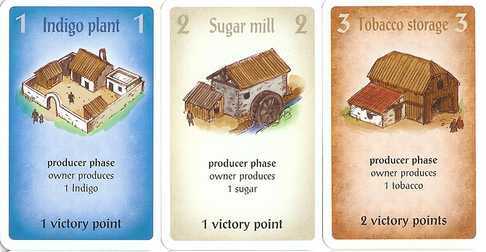 Production buildings (producing the familiar indigo, sugar, tobacco, coffee, and the newly added silver) can also hold a face down card as a "good" which remains there until sold. Cards in your hand also represent money, and are spent to purchase buildings. indigo plant and tobacco storage cards to buy the sugar mill. Producer: Everyone gets ONE good card on a production building. The producer gets one extra. Builder: Everyone gets to build ONE building. The builder pays one less card. Trader: Everyone gets to sell ONE good to the trading house. The trader gets to sell one more good. Prospector: The Prospector gets a card and everyone else gets nothing. Councillor: A new role, everyone draws two cards and keeps one, discarding the other. Councillor draws three extra but still keeps one. The game ends when someone puts up 12 buildings (which is also an endgame condition in Puerto Rico) and victory points are added up. Some of the building give endgame victory points, just as in PR. The gameplay is quick, and you can usually get through a hand of San Juan in about 20-30 minutes. The builder is taken by someone almost every turn, and 11 builds wins the game (you start with one building) so the game usually lasts only 11 to 13 rounds. Choosing which buildings to build and which ones to discard can be mind-wracking, and the game is by no means easy, even though it is lighter than it's older cousin. We played 3 games, and the result was not what I expected. Bill and Alex essentially declared me "crazy" if I was thinking of selling this game. So...I guess I'm keeping it. If you don't read the comic, you should consider it! I bought Penny Arcade for the express purpose of selling it. I paid $8 for it at auction, and figured I could easily sell it for double that. Well...I thought I could. Once again, I put it before the game group to play it at least once before I sold it. Step back far enough and it looks like you're playing Dominion. 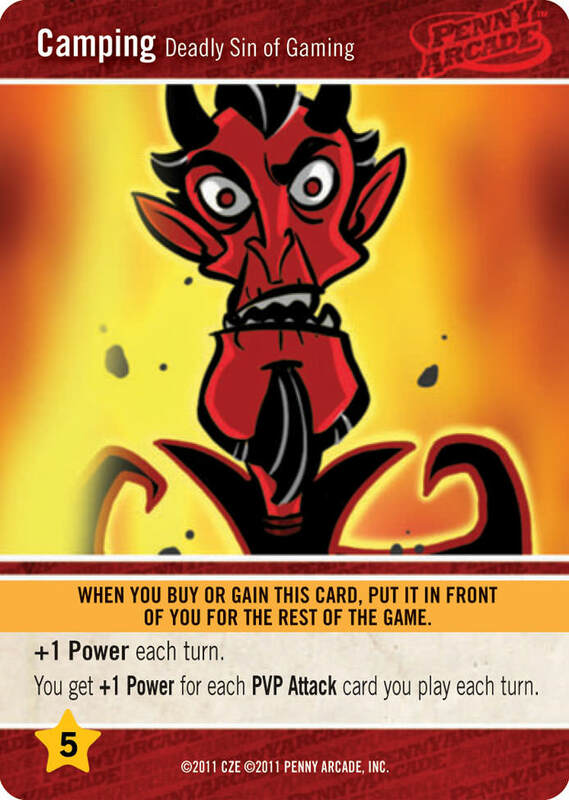 This particular boss card fittingly give you the ability to play more evil cards. There are some very key differences between this game and Dominion. The biggest is that the point cards in Dominion make your deck less efficient, as they are useless when drawn into your hand, so in the early stages you try to avoid taking them. The boss loot cards in Penny Arcade have the opposite effect...they're some of the best cards you can get. As a consequence, this game is a lot more of a "race" game, and it goes much quicker. We played. And then we played it again. Then again. Then two more times. The players could not get enough of this game. One actually declared it "better than Dominion." I disagree. I like the stricter mechanics of Dominion, and I think it's a better game, in the sense that the challenge is greater. But this one is a lot more fun, and a lot less work, and I think there would be a small game night riot if I got rid of it...they're urging me to buy the expansion instead! I love Forbidden Island, but I'm going to buy Forbidden Desert soon, and I figured Forbidden Island was done for. I was planning to sell this game, but I decided to see if maybe my 5 year old daughter could play it first. Big mistake! There's no getting rid of this game now...it's her favorite! The initial setup of the game, a "round" island that is sinking into the sea. 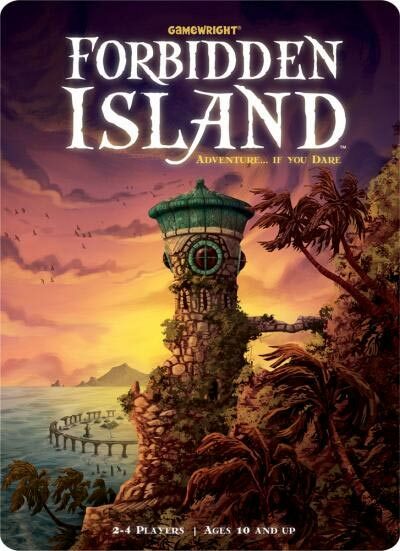 The premise of The Forbidden Island is that 2-4 explorers have crashed on an island that they were going to explore. To get off the island they must find 4 treasures and return to the helicopter launchpad, a task which is greatly hampered by the desire of the island to sink into the sea. 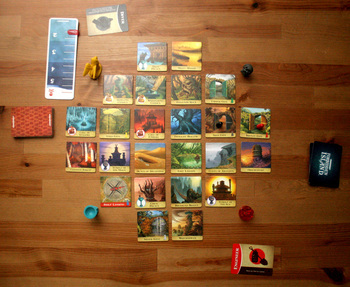 On their turns, players get three actions, which can be used to move, shore up a sinking island tile, or transfer cards to other players, or claim a treasure. Each player turn ends with an island sinking phase, which tends to make the explorers' lives miserable. The island starts to get crowded when most of it has sunk. Each player has a special power, and the rate at which the island sinks accelerates as the game goes on. The thing about this game is that it's extremely accessible for nongamers and for kids, and my 5 year old absolutely loved it. Her first few games she was geniuinely scared about the theme, shrieking wildly when an island tile sank into the sea, but after a few plays, she is in love with the game! We always play at the novice level for her, but if you start the game at "expert" the challenge is high enough even for the serious gamer, although the game offers too few meaningful choices to truly be a top-level cooperative strategy game. But, since it's my daughter's favorite game...how can I sell it!?! You're obviously doing it wrong. Doing it right would be to invest in some of those rolling library shelves -- the kind that pack together so a whole room is almost all shelf with one narrow pathway that can be "moved" to between any arbitrary pair of shelves. Then you'd have space for a whole bunch more games.